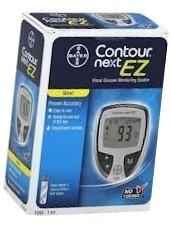 The Bayer Contour next EZ meter has large, easy-to-use buttons along with a large display. The Bayer Contour next EZ meter requires only a 0.6 microliter blood sample. Automatically compensates for common interferences. Testing can be performed on the forearm or palm to reduce discomfort from repetitive testing in the same area.